During the summertime I really enjoy making homemade S'mores for my family. With that said, we're also big donut eaters too! So, when I saw this recipe that is super easy to make that combines both of them together, I just knew I had to try it. The recipe makes 8 servings and they're super easy to make! How fun! Cut Entenmann's® Rich Frosted Donuts in half horizontally. Spread marshmallow topping on the inside of bottom half of donuts. Drizzle chocolate syrup over marshmallow topping moving side to side. Place graham cracker square in plastic sandwich bag. Seal the bag and hit it with the back of a spoon until you have small pieces. Sprinkle graham crackers on top marshmallow topping. Place the second half of the Entenmann's® Rich Frosted Donut on top with chocolate side up. What a fun dessert....they look delicious! 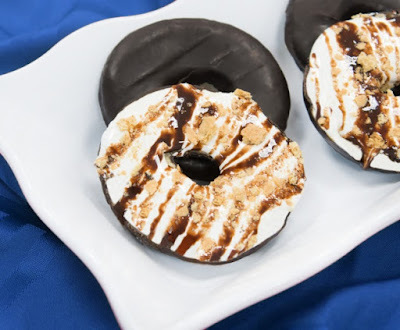 This is such a creative way to change the donuts into a S'mores treat. It is easy to do and I shall try it soon.